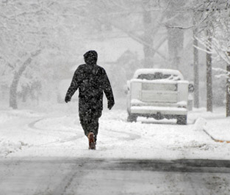 Staying warm and safe may become a challenge when the mercury drops significantly below normal, especially if you have to deal with power outages. Exposure to cold temperatures, whether indoors or outdoors, can cause other serious or life-threatening health emergencies. Infants and the elderly are particularly at risk, but anyone can be affected by the most common cold-related problems: frostbite and hypothermia. 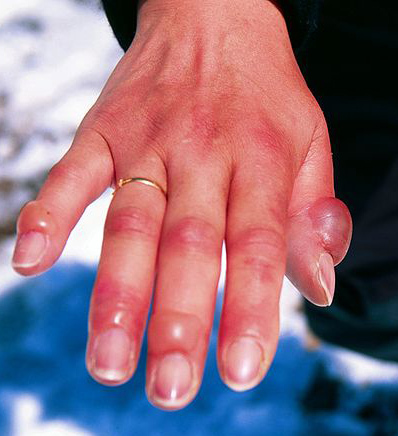 Frostbite (or frostnip which is the early stages of frostbite) is when certain parts of your body are exposed to severe or extreme cold – mainly your fingers, toes, ears, cheeks and nose. Freezing temperatures can form ice crystals in the fluids in and around cells in your body. This damages and dries out cell tissues and membranes, and extreme cases can impact deep nerves, muscles or even bones… or even lead to the loss of a limb. Handle area gently; DO NOT rub it! Remove tight or constrictive clothing (gloves, boots, socks, etc.) and any jewelry. Loosely bandage area with dry, sterile dressing or cloth. If fingers or toes are frostbitten, separate them with sterile gauze or clean cloth. Try not to break any blisters. DO NOT rub or massage the area since this may cause damage to cells! DO NOT rub snow on the area! DO NOT try to warm with dry radiant heat (meaning don’t warm with a blow-dryer or hold in front of fire or hot stove). Using warm water is best. DO NOT try to thaw a frostbitten body part if it has a chance of re-freezing (if you are stuck in the wilderness) since this could cause more damage. Hypothermia starts setting in when your body core (the vital organs – heart, lungs, and kidneys) drops below 95 degrees Fahrenheit (35 degrees Celsius). When exposed to extreme cold for a long time, your brain begins to shut down certain bodily functions to save internal heat for the core. Gently move victim to a warm place. Check breathing and pulse (ABCs… Airway, Breathing, & Circulation). Handle victim gently and DO NOT rub body or limbs. Remove any wet clothing and replace with dry clothing and/or blankets. Cover the head and neck with a hat or part of a blanket (75% of the body’s heat is lost through top of the head). If hot water bottles or hot packs are used, wrap them in a towel or blanket first then place on side of the chest and/or on groin area. (If heat is put on arms or legs then blood could be drawn away from body core – keep heat on the core!) Also the below graphic from Princeton.edu demonstrates placement of heat packs and how to do a wrap on a victim. Let victim sip a warm, sweet, nonalcoholic drink. Keep the person dry and wrapped in a warm blanket, including the head and neck, even after their temperature has increased. DO NOT rub or massage the victims’ limbs! DO NOT put victim in a hot bath! It will warm him/her TOO quickly. DO NOT put hot packs on arms or legs… put them against the body (chest or groin area). Disclaimer: These procedures are not substitutes for proper medical care. Frostbite should be evaluated by a health care provider and hypothermia is a medical emergency. Above data extracted from IT’S A DISASTER! …and what are YOU gonna do about it? by Bill and Janet Liebsch also appeared in PREPARE Magazine. And visit our Look inside the book page for more preparedness topics. This entry was posted on Monday, January 6th, 2014 at 07:44 and is filed under first aid, health, winter storms. You can follow any responses to this entry through the RSS 2.0 feed. You can leave a response, or trackback from your own site. It is important for your workers to understand the difference between the both, the signs of both and how to treat each one in an emergency situation. Excellent point Caleb .. and thanks for stopping by.